The Edit Exposure Paste Preset dialog box lets you reuse key exposures as you animate. From the Timeline view menu, select Edit > Modify Paste Presets > Exposure. 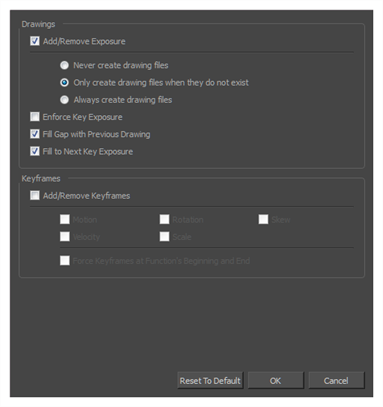 Only create drawing files when do they do not exist: When adding exposures to a drawing layer, new drawings will be created only when drawings with the same name do not already exist in the destination. Fill to Next Key Exposure Fills selected area till the next key exposure. Return all values to their defaults.